This mini breastplate is hand crafted from genuine buffalo bone beads, and has agate stones and silver beads, and coffee and black crow beads. It has a row of black onyx stones in the middle row and silver beads and black crow beads on the outer rows. It is strung on sturdy genuine leather strips and has long fringes along each side. This mini breastplate would work as a breastplate for a small child or use it as a neck ornament for adults. 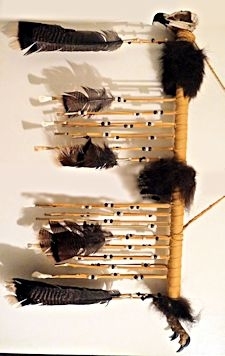 It is about 10" long x 10" wide, not counting the leather fringes along each side and the neck ties. Breast plates were worn by Plains tribes as ornamentation, and for protection in battle. You will love this mini breastplate!